The new hockey season is officially here!!! With it, comes a bunch of new ROMs. As I did a "pre-season" version, I am now excited to present my official 2019 season ROM!!! *Link for the ROM is below the in-game images. *The "Winnipeg Freeze Bug" exists on this rom as it affects all 32 team roms. *I created a new structure for all teams. Each team has 3 goalies, 14 forwards and 8 defensemen for you to choose from prior to a game. *This ROM is a “healthy/best case scenario” ROM. That means, most injured players are in the line-ups. I prefer it that way as it is more fun to play. *Many of the line combinations and D pairings were used or are being used (currently) during this season. *32nd team is a 2019 Prospects team (featuring Jack Hughes & Kaapo Kakko). 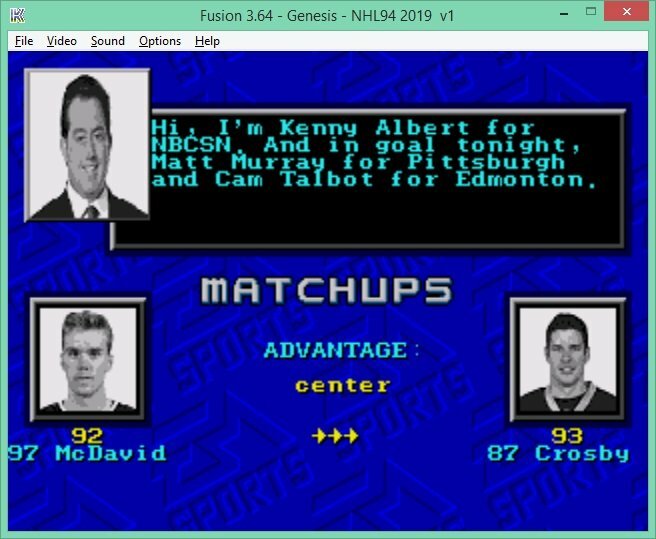 *Kenny Albert is the new “Ron Barr” in my rom. Any and all feedback is welcome and appreciated! If you catch any mistakes/errors, please let me know. Just as a "heads up", like last season, I will be doing a 3v3 version of this ROM. I will release it, sometime, later this month. Several jersey numbers were updated after I posted my 2019 ROM (on opening day). I went ahead and updated those numbers as well as made two player updates. MIN traded Olofsson to MTL and NJ signed Stratford. Both occurred after I originally posted the ROM. If anyone notices any errors or whatnot, please let me know. I am still working on a 3v3 version of this ROM and will post it sometime this month. Right on! Thanks Sauce. Just a heads up, I had a weird glitch with the team matchup screen. The Kenny Albert text repeated itself over and over. Not game breaking but just wanted to give you a heads up. Thanks @bbb777! That's weird that it is happening... I never noticed before as it doesn't do it in my 2018 ROM. I did some changes in the hex code, for this rom, so I'll see if there is a connection. If I can get it fixed I will re-post. Thanks for bringing to my attention! The issue has been fixed an I have re-posted the corrected rom. Special thanks to @slapshot67 who quickly discovered the issue. Some of the commentary text got cut off when I edited it to be for Kenny Albert. All good now! It was brought to my attention, last night, that there may be a potential error of sorts. The team rankings were not the same as in my 2018 version. It was indeed an error and not by design. Not sure why they didn’t carry over when I made a 2019 edition. Anywho, I fixed and reposted the ROM. They are correct in my 3v3 rom as well (posted last night). I keep the teams set as “average” for offense and defense ranking as well as for their PP, PK, Home and Away settings. This allows for some unpredictability to go with the players individual skills (vs being “hot” or “cold”) to help determine outcomes. I did this last year and enjoyed the gameplay. Apparently, others did as well. I'll take this one for my tournament. Thanks for the hardwork! Sounds good! This version (knock on wood) and the 3v3 have been checked and I haven't discovered anything else to update/fix/address in the here and now. That said, if that remains the case, I won't be updating it until later this year/early next year when enough roster changes have occurred and we see how players are trending for the year. So, definitely feel free to use this version. Thanks for downloading... have fun with it! Wowwy wow. Excellent work, Sauce. You seem to really know the whole league well. KFTC! I just posted v1.1 of this rom. It was pointed out, to me, that there was an error on the NJ roster. I have fixed it but also used it as an excuse to post more updated version. I updated the NLC for a handful of teams, including certain player portraits. These teams include, CHI, EDM, NYI, VAN, VGK and WAS. I also updated a couple of rookies (and a couple of vets) by giving a slight to modest boost to their ratings (notably Elias Pettersson who is killing it this year, so far). I have re-posted the file (again) as I just discovered the same issue with the Buffalo team roster that I had with the NJ roster (mentioned above). Both have been fixed. It dates back to this summer. Long story short, I got sloppy (and lazy) with the exporter/importer tool and didn't pay attention to certain important instructions. Lesson learned. I did my best to comb this file and I think I have, now, cleaned up my error for good (knock on wood). If anyone catches something that appears to be a mistake (such as jersey number, wright, hand, etc. ), please feel free to let me know. Oh, and I did give Elias Petterson a little more of a bump in ratings and the kid is just awesome (so far)! Just wondering if anyone else is seeing an issue where going through options in the main menu causes the game to freeze up and to display strange colours. The only known/reported issue with my Rom (Skip’s and Naple’s have the same) is the “Winnipeg Freeze Bug”. That only happens if you allow the game to display the Jets player portraits in the main menu screen. There have been several posts about it if you do a search. If you use Kega Fusion, it won’t freeze. It displays a weird error code under the player portrait names. No big deal (IMO). Besides that freeze bug, I haven’t seen or been informed of any other freezes (was playing the rom as recent as last night). Now, not an "issue" but rather a human error, if you don't synch a player portrait correctly, the main menu screen will freeze and have some funky colors. However, that is based on one, incorrectly, having done a player portrait update. Unrelated, I am posting V2, of this rom, this weekend. The William Nylander “sign or you miss the season” deadline is 12/1. Just waiting on that status update. Plus, we are at the first quarter mark of the season so it seems like a good time. I have updated the rosters with all in-season trades including yesterday’s between CHI & ARZ. Added some new players too and removed some as well. V3 will be done at the trade deadline. V4 will be the Playoff Edition. Unrelated, I am posting V2, of this rom, this weekend. The William Nylander “sign or you miss the season” deadline is 12/1. Just waiting on that status update. Plus, we are at the first quarter mark of the season so it seems like a good time. Per the above, I am posting an updated roster (v2 in the OP). It was announced 3 minutes before today's 5:00 EST deadline that William Nylander re-signed with the Maple Leafs. I reposted v1.1 as well. 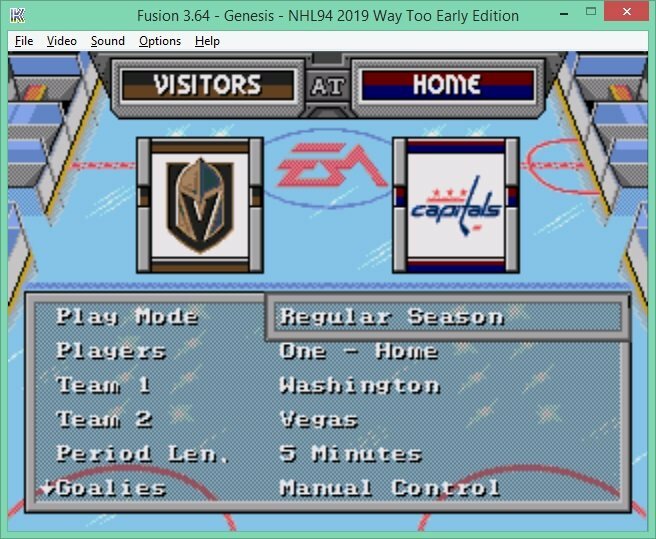 Like version 2, I made it default the main menu to "manual goalie" as I didn't notice it was on auto. There were no other changes in the event you like(d) version 1.1. I also posted both files unzipped for convenience. V2 includes some new players as well as some player edits here and there. All roster moves are as of today. Hi All...so ignore what I mentioned above (back in December) regarding doing a v3 and a v4. I have decided to do 5 in total, for the year. So, instead of waiting until the trade deadline for v3, I am releasing it today. There has been a lot of activity since my last roster posting at the beginning of December (albiet, nothing Earth shaking). I FINALLY got around to updating the player portraits for all NLC players on each team. 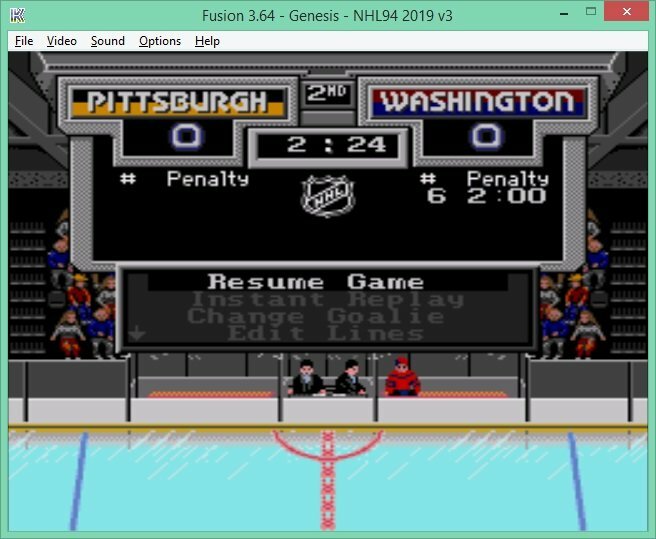 When I started this project, last year, I used Skip/Slapshot's rom template to get the ball rolling. Since that time, I have edited over 800 player ratings in my own fashion, tweaked all jersey colors, refreshed all team logos and now, updated all portraits. Previously, I "borrowed" theirs as I slowly added some new ones when needed. So, special thanks to @skip and @slapshot67for being cool with that and not calling me out for being too lazy to update all art 'til now. I have updated the roster as of today. Lines and D pairings are NOT 100% accurate. There are a few AHL call ups that I couldn't add as I didn't have an opening within my 3 goalie/14 forward/8 defensemen team structures. Anywho, as some of you know, I base my ratings on a 3 year average (with an occasional exception) so I just re-reviewed/updated the average As of mid season. Things like shot accuracy and passing, for example, are not based on one season or a particular season's %s. I like trends and a 3 year makes it more interesting to me. I don't do a season average because we can't play a season mode. Plus, I try to avoid what I call the "Jonathan Cheechoo" effect (google his stats and you'll see what I mean). I base shot rating (for example) on a "per game average" vs season YTD shooting %. This better allows the "stars to be stars." Ovechkin, for example, has a top 5 goals per game average and a not-so-great shooting % based on how often he shoots, in a season. So, for example, his season average of maybe 50 goals over 300+ shots isn’t a high shooting percentage. But 50 goals over 82 games is a higher number and justifies a higher rating. As we can only play exhibitions, I prefer to have a per game average vs season long. The per game averages l, that I use, also factor into hits, passes and shots per game. As for goalies, I have a slightly more complicated way of rating them. I won't get into that today. Anywho...thanks for reading my long-winded crap and enjoy! V3 is in the OP above. Next update will be at the trade deadline followed by the playoff edition. For those of you who don’t want to read my latest novel... I mean post above... the short story is, version 3 of my season rom was posted at the top of this thread. A buddy of mine noticed funky glitch in my 2019 roms. It doesn't effect gameplay but rather, the look. As you may know, I have the custom helmet/sleeve patch in the rom. It was negatively affecting the penalty box scenes as a home players helmet would be 25% the custom color and 75% the home jersey color. It affected several teams. It also changed the strips on the sleeves of home players. @slapshot67 was awesome, as usual, and helped me fix it. Here are the before and after shots. I have re-uploaded the file as 3.1 in the original post and all future season roms will have the fix. V1 & 2 will not be updated. I'm new to the forum and wanted to commend you on this outstanding ROM! 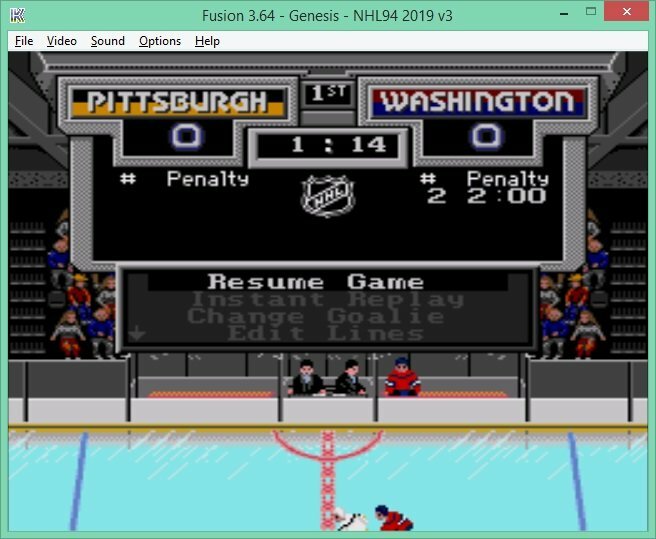 What a perfect way to keep NHL 94 alive, especially on its 25th Anniversary. Thank you for all your hard work and commitment to updates! Regarding tinpanalley's issue, I experience the same thing. As long as I select my teams/options quickly on the main menu, it won't freeze up. Might have something with playing on the SNES Classic Mini w/ Retroarch, not really sure. Will be interesting to see if anyone ever remedies the Winnipeg freeze bug, which is a non-issue to the enjoyment of the game. Thanks for the kind words. Much appreciated! I have not experienced any issue (per your description) with the main menu other than the Winnipeg Freeze bug which is well known on this site. I use Fusion as my emulator and don't have any issues. In fact, the Winnipeg Freeze bug doesn't occur, with my rom, if you use Fusion. It does with Gens and other emulators (perhaps Retroarch as well?). With Fusion, there is a funky code that shows within each Winnipeg Player portrait but, you still see each player without any freeze. My rom was originally Skip/Slapshot's rom (until I did an overhaul of all art and ratings). 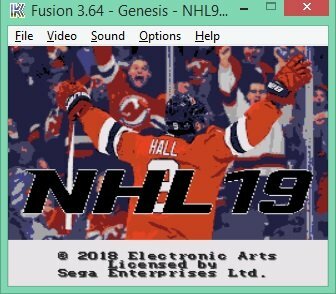 I haven't seen theirs have any issue on Fusion either (as I have tried it out) which brings me to the question of have you tried it on other emulators (namely, fusion or gens)? There is a fix to the Winnipeg Freeze bug but, it negatively affects player card data. I tried it out, once, as the great Smozoma discovered the fix and wrote out the instructions (back in 2016). After trying it out, it just wasn't worth it, to me, to have the player card data compromised. When the rom was extended to 32 teams, it appears that certain things were affected. Small price to play for 32 teams. Most folks seem ok with the bug and as I said, you can use Fusion to overcome it if it is a real bug-a-boo for you. 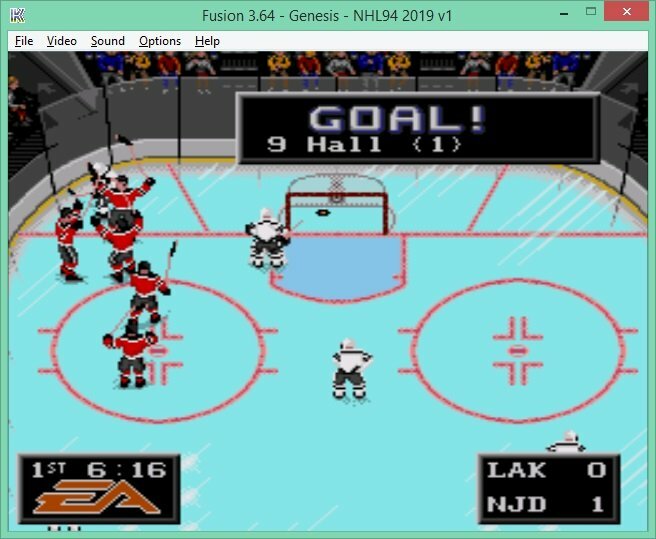 I haven't seen theirs have any issue on Fusion either (as I have tried it out) which brings me to the question of have you tried it on other emulators (namely, fusion or gens)? I plan on trying some other emulators and will report back. The freeze bug doesn't bother me in the least. I'm just thrilled this ROM has all the current teams and players! I was also pleasantly surprised that my OT period was 60 minutes. Keep playing until someone wins, something the NHL should consider, IMO. I purposely did 60 min OT as there is no shootout. The odds of making it the full 60 are low. I agree with you as I don’t like shootouts either. I wish the league did 5 mins of 5v5 OT and if no winner... 4 mins of 4v4... 3 mins of 3v3. And if there is still no winner, then do a shootout. Oh well. Working on updating v4, of this rom, now. Will be out at the trade deadline. What does making all the goalies speed zero do? I also noticed all the checking ratings are really low. What does that do to gameplay? I found the goalies to be less spastic and remain closer to their net (on average) when I reduced the speed to zero. It’s not an exact science, and not 100%, but it felt noticeably different for/to me. Having a good agility is what matters with goalie side to side movement and reflexes. Perhaps, a zero speed makes them take less risk? It also seems to keep them away from the trapezoid on average. Maybe the CPU logic thinks that a goalie shouldn’t come too far out of net, with attackers coming, if their speed is low. I play manual goalie and haven’t had any issues. I play sim as well and as noted above, like what I see from the goalies. The checking, like most of my ratings, are on a per game average over a three year span. They may be a touch lower than some because I got tired of seeing certain players get 8-10 checks in a five minute period. It’s not realistic. Again, not a 100% exact science but I am liking the results compared to how I started last season. 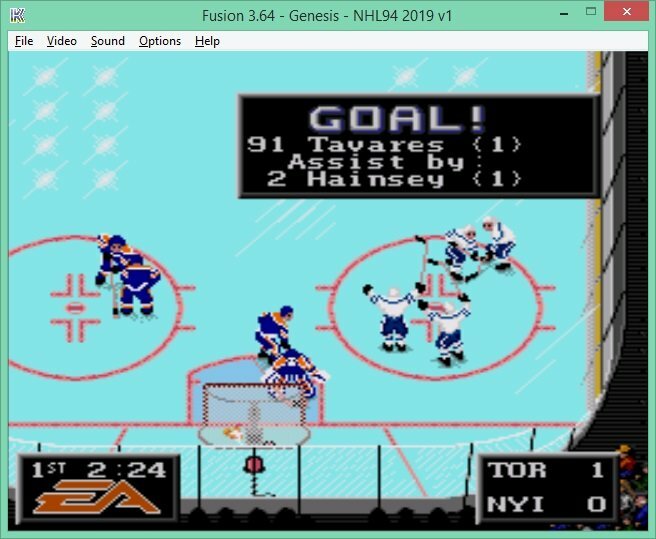 I gave Fusion a shot last night, no issues at all. Appreciate the suggestion! And speaking of suggestions... and at the risk of being the new guy making requests, I would add to any existing endorsement for a 13 or 14 minute period option. Based on my observation (and completely subjective opinion, lol), it would produce the most accurate NHL game shot totals - typically around 30 on average for each team. I know EA never had a 'true' game clock in this generation and the 10-minute option seems to move a shade too brisk. Just an idea to take or leave - I think the included 7 minute period is really great, too. Kudos on offering some customization there! Looking forward to Version 4 (and seeing if my Isles make any smart moves by the deadline!). Thanks for the feedback/suggestion. I may give it a shot and see if I like 13/14 min periods. I haven't hear anyone mention it before. Can't promise I'll change it but, you never know. The good news is, if you download NOSE, you (the user) change customize the period lengths - super quick and easy. I like both of these points, especially the checking. Anyone else have feedback on the goalies in this rom. I appreciate the thought put into the goalie ratings. I've been guilty of oversimplifying at times into "good goalie", "average goalie" and "bad goalie" because the effects of the ratings haven't been documented and discussed nearly as well as those for the skaters. Anytime...I'm always tinkering with the game to see if I can find a balance that feels right. There isn't an exact science and nothing is 100% but there seems to be improvements with the right attribute combinations. Some additional food for thought... dialing back the checking and aggressiveness leads to less penalties. You also see a dip in the checks per period which feels more realistic (even for a video game). While I can't say it works every time, I have noticed an improvement by doing so. Not as many penalties called in my latest roms on average. I often play 5 or 7 min periods and it is frustrating to see your team in the box for half to 3/4 of a short period because guys keep getting whistled. More insult to injury when it is one after the other. It's not realistic if it happens too often. Back to goalies, in real life, goalies don't typically play out of the net aggressive when attackers are coming (unless you're Hasek). That said, on average, by lowering the speed to zero, it's almost as if they consider coming out of net to play the puck but, at the last minute, decide against it. I have simmed a lot of games and unless I was hallucinating, it seemed to help on average.